Tonight's support act is a Southern Rock band - The Cadillac Three. I've been listening to the album quite a bit lately while reviewing it, so when I heard on the day of the gig that they'd been added to the bill, I was pleased as I wasn't able to make their only other UK gig the previous night. As the name suggests, they're a trio - a drummer, a singer/ lap steel guitarist, and another guitarist. One of them sits throughout, playing the lap steel guitar, which is played with the guitar laid flat on the players lap rather than like a normal guitar. The other guitarist stands and moves around as he has more freedom. 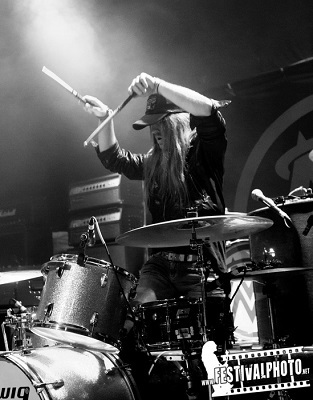 For a three-piece they have a very good full sound, and tonight we get some great southern rock. Unsurprisingly the songs they play come from their newly released album, and they sound great. I must confess to enjoying their set a bit too much and forgetting to write down the songs they played, but I do remember them playing songs including "Tennessee mojo", "White lightning" and ending with "Down to the river". It was a great set, and although they're quite different musically to Michael Monroe they did seem to go down well with the crowd. Next up was Michael Monroe - a true entertainer. The man really knows how to put on a good show and I've never seen a bad performance from him. With a rich back catalogue of material to choose from we get a mix of songs from his two latest solo albums, along with some Hanoi Rocks songs and even some covers. 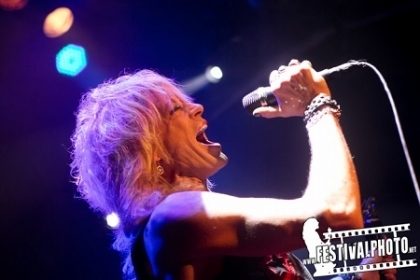 Michael Monroe doesn't just sing either - he plays saxophone during some songs, and even the Harmonica. Whether he's singing or playing an instrument though, one thing is for sure, he won't be standing still - the man has so much energy and enthusiasm that he puts into every show that he's constantly moving, either racing round the stage or deciding the stage is too limiting (he has a habit of either climbing up things, balancing precariously on the crowd barrier or just diving into the crowd). Tonight he tells us that he's been told not to do some of these things, and almost immediately stands with one foot on the stage and the other on the barrier and say's he might have just broken the rules. Later the rules go completely out of the window as he sings standing on the bar. It's a great show as always, packed with great songs - the solo material on the two latest albums is great and goes down very well, but for me as a Hanoi Rocks fan, the highlight was of of my favourite Hanoi Rocks songs - "Malibu beach nightmare". A great gig from both bands.